Glensound sales and marketing manager Marc Wilson with the Paradiso and Inferno Dante commentary units. Audio over IP (AoIP) has in recent years been making inroads into the technical sub-sector of commentary, which lends itself well to modern networking techniques. Glensound is among the specialist manufacturers that has been embracing this new way of working and is showing a range of Dante-equipped commentator boxes, plus ancillary devices, at the 2016 NAB Show. This year's Las Vegas expo is highlighting Glensound's ongoing adoption of Audinate's Dante Ethernet-based audio transport system, which is able to accommodate AoIP. The UK manufacturer has produced Dante versions of some of its established commentary systems, while at the same time developing new products based on the networking format. The three updated products being highlighted at the NAB Show are the Express ip, a version of the two commentator Express Box; the GS-FW012 ip, which brings Dante to the GS-FW012 four-wire, four-channel system; and the Vita, based on the GS-CU004 belt-pack. The Express ip has two commentary positions with four headphone inputs; the individual commentators are able to create a personal monitor mix by using four separate level pots. 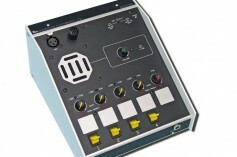 The talkback sector offers two programmable settings for each person, with the ability to switch mics for intercom use. There is a direct mic output to the network for each commentator; one of which can be switched as a commentary mix. The GS-FW012 is a desktop system with four discrete intercom keys to each of the 4W circuits served by the box. It has a top panel loudspeaker that works with an integral mic as well as offering a connection for an external microphone. The Vita belt pack is a Dante, two-circuit, 4W device that connects to networks over one CAT5/RJ45 port, which additionally provides power through PoE (Power over Ethernet). Headsets can be plugged into the XLR input using a 6.35mm jack socket, while both 4W outputs are equipped with programmable switches to change from main mic input to the 4W outputs. Glensound previewed a number of its new Dante products at the BVE show during February. Key amongst these is the Paradiso, a three commentator box that sales and marketing manager Marc Wilson described as a successor to the GDC-6432 digital commentary system. It has a single CAT5 connection to Dante, with audio I/O over the Ethernet format or local XLRs. Paradiso delivers eight monitoring inputs, four talkback ouputs and direct mic outputs plus mix. "It's very much an all-encompassing solution," he said. "It has I/Os on the rear but can also be used as a standalone unit. We see it being used more for television broadcast at bigger stadiums and venues for large-scale productions." Wilson added that the Paradiso was an example of demand for Dante networking coming from the market. The unit is due to be formally launched in the autumn. Also on show at BVE were the Inferno, a single commentator box with a single CAT5 link for Dante, seven monitoring inputs, seven talkback outputs and one master output; and the Dark series of Dante interfaces.